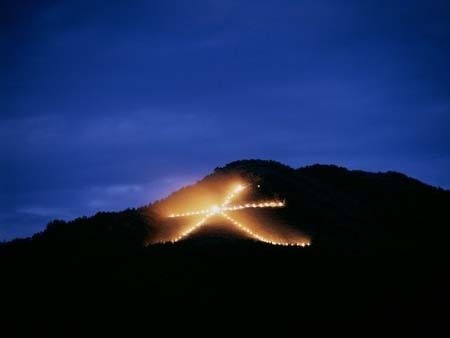 The Daimonji Gozan Okuribi (Daimonji Bonfire) is an event held on the evening of August 16th, when gigantic Chinese characters and other motifs are depicted by fires lit to illuminate the surroundings for patrolling on the slopes of the mountains surrounding the Kyoto Basin. It is a famous for evoking the image of a Kyoto summer. 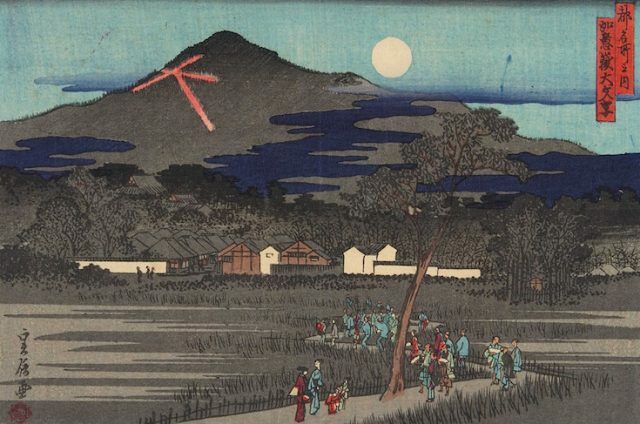 Although there are several interpretations as to the origins of this event, it is generally regarded as a fire set alight at the gate for seeing off the souls of ancestors after commemorating the welcoming of their souls. The character of “dai” (meaning “large”) on the Nyoigatake peak, and those of “myo” and “ho”which make up the word “Myo-ho” (wondrous teaching of Buddha) on Matsugasaki Nishiyama and Higashiyama mountains are famous. The upper horizontal first stroke of the character “dai” measures 80 meters long. The second stroke, which is the curved line from the center top to the bottom left, is 160 meters long, and the curved third stroke from the center top to the bottom right is 120 meters long. Seventy-five fire burning areas are set up, where split firewood of pine tree and pine needles are piled up and set ablaze around at 8 p.m. in the evening. The fire burns for about 30 minutes on each of the mountains (with slight differences in duration). Moreover, it has been believed since olden times that if you drink sake or water with the burning Daimonji characters reflected in your cup this very night, you will be protected from illness. The best viewing spot for the character “dai” the Nyoigatake is on the Kamogawa River bank, while Kitayama-dori (near Notre Dame University) is ideal for “myo,” as is the Takanogawa River bank (north of Takanobashi Bridge) for “ho” Nishi-Oji-dori (Saiin sta. – Kinkakuji Temple) is a good spot to view the “dai” at Hidari-Daimonji and Kitayama-dori (northwest of Kitayamabashi Bridge) offers good views of the funa-gata motif. The torii-gata motif is best seen from Matsuobashi Bridge and Hirosawa-no-Ike Pond. From the highest point of Funaokayama Park (free admission), you can command a panoramic view of all the mountains with the exception of the mountain with the torii-gata motif.